Dr. William "Will" Rodman (James Franco), a San Francisco area scientist at the biotech company Gen-Sys, had been working for five and a half years researching ALZ-112, a genetically-engineered or modified retrovirus that repaired brain cells. It was a "gene therapy that allows the brain to create its own cells in order to repair itself" - a process called neurogenesis. He speculated it could be a cure for Alzheimer's Disease, or could treat a wide range of brain disorders - with "the potential to save lives." It would mean overwhelming profits for Gen-Sys. Overjoyed at the trial results on the Lucas Tower for 'Bright Eyes' after only one dose of 112, Will reported the extraordinary results to his opportunistic boss Steven Jacobs (David Oyelowo): "The 112, it works" - and he was allowed to report his findings to the Board, although Jacobs feared he was possibly rushing things. As Will delivered the promising report to the astonished Board and was requesting permission for the next phase of testing - human trials, unexpectedly, 'Bright Eyes' aggressively attacked one of the lab workers. She escaped from her cage and went on a rampage throughout the facility, and eventually crashed through the window of the Board room meeting, where security guards shot her dead in full view of everyone. Permission would undoubtedly be denied by the Board. Jacobs believed that the twelve chimps going through the new gene therapy were now contaminated. He ordered Robert Franklin (Tyler Labine), the kindly Gen-Sys chimp handler, to euthanize all of the apes: "Find the most cost-effective way to put those apes down." As expected, the Gen-Sys Board denied Will's request and chose to advance other programs and not develop ALZ-112 any further. Jacobs told Will: "You will never convince anyone to invest another dime." Franklin then discovered that Bright Eyes' aggressive rampage was not due to ALZ-112, but to her protective maternal instinct. He had found an infant chimp, to whom the ape had secretly given birth a day or two earlier. He showed the baby ape to Will, who reassessed: "She wasn't being aggressive, she was just being protective?" Franklin asked for Will to take care of the ape in his home for a couple of days until he found a sanctuary for it - otherwise, it would also face euthanasia. Franklin opted not to carry out his orders on the baby chimp, and gave the choice to Will. Will brought the chimp home and began raising him in his house. Will's father Charles Rodman (John Lithgow), a former "beloved music teacher" in SF, was suffering from Alzheimer's Disease, and required daily home health-care aid from Nurse Irena (Chelah Horsdal). When he first glanced the small baby ape, he took a liking to the smart, "cute little guy" and shortly later named it Caesar ("But as for Caesar, kneel down, kneel down and wonder"). During Caesar's growing-up years, Will kept a log, and noted by his third birthday: "Right away, Caesar displayed signs of heightened intelligence. By 18 months, Caesar was signing up to 24 words. By age 2, Caesar was completing puzzles and models designed for children 8 years and up. At age 3, Caesar continues to show cognitive skills that far exceed that of a human counterpart. He completed the Lucas Tower in fifteen moves, "a perfect score." Will kept him at home (and made the attic a playroom for the ape), where he often brought his work to be near and tend to the active, fast-learning, acrobatically-inclined animal. The green in his eyes indicated that the ALZ-112 gene was passed onto him from his mother during pregnancy, and he had inherited "radically boosted healthy brain functioning." Worried about his father's deteriorating condition, Will decided to take four vials of ALZ-112 from the lab, and inject some of the sample drug into his father, promising: "It'll make you better, Dad." After only one injection, Charles was remarkably improved, and he exclaimed: "I'm not sick anymore." At the same time, Caesar escaped through an open window when attracted to a neighbor child's bike, where he was assaulted in the next yard by hot-tempered, mean neighbor Hunsiker (David Hewlett) wielding a baseball bat. Caesar sustained a small cut on his leg, and was taken to the SF Zoo (disguised in a baby carriage) to primatologist/vet Caroline Aranha (Freida Pinto). She sewed him up with dissolvable stitches. Will invited her to the house for dinner, when she asked about Caesar's secret. Will explained: "I can't take any credit. It's in his genes." She cautioned: "He's gonna soon grow into a large, powerful animal." She added that it was "appropriate" to be afraid of chimpanzees, although Will responded that Caesar wouldn't hurt anyone. To provide him with open space, Will (with Caroline and his dad) took him on many day trips to nearby Muir Woods National Monument, to the "redwoods, it's paradise." Although leashed at first, Caesar was unhooked, made a supplicating gesture with his open extended palm to ask for permission to wander off, and then excitedly rushed into the woods to stare up at the towering redwoods. The film transitioned to five years later - as Caesar quickly grew in size as he lept from tree to tree. Caroline and Will had become a boyfriend-girlfriend couple. During one of their picnics in the woods, Caesar encountered another family's pet, a growling German shepherd. Caesar roared back, and then resented being leashed and treated like the dog when they left the park. He signed to Will, asking if he was a "pet." He then asked about his identity: "What is Caesar?" Will drove to the parking lot of Gen-Sys, and described how he had become his adoptive father after Caesar was born there - his place of work. Caesar's real mother (now deceased) and eleven other apes had been given intellect-enhancing "medicine" - passed onto him: "That's why you're so smart." Caesar had been secretly taken from the lab, and thereafter exhibited "incredible signs of intelligence." Caroline was visibly upset by the revelations ("This is wrong, Will") - she protested that the drug had been applied illegally both to the ape and to Charles. Will argued that the remarkable effects of the drug 112 warranted what he had done. Caesar's IQ had doubled, and his dementia-suffering father was brought back to life. Unfortunately, Caesar began to show signs of rebellious self-awareness and the knowledge that he wasn't human, while Charles began to revert back to a forgetful and confused state. Antibodies in Charles' immune system had developed to fight the 112 virus, so that the effects of the gene therapy diminished, and the disease started to "return with a vengeance." One morning, Charles - with his health deteriorating - entered a Mustang parked on the street in front of the house - his neighbor Hunsiker's vehicle, when he saw the keys in the ignition. [Caesar heard the bell on the opening gate ring - as he was assembling a green puzzle of the Statue of Liberty - a referential nod to the conclusion of the first film.] Charles crashed the car, front and back, into other parked cars. Enraged at Charles for irresponsibly causing the damage, Hunsiker phoned the police. Caesar witnessed what was happening to his friend and came to his defensive rescue. While screeching, he angrily jumped on Hunsiker, beat on him, pursued him, and then bit off his index finger before being cradled in Charles' arms. Animal Control authorities, under court orders, transported Caesar to the San Bruno Primate Shelter, run by John Landon (Brian Cox). Distressed and scared by the new surroundings, Caesar was introduced to the open, jungle-themed exercise/play area, but then held in an individual cage for most of the time. It would take him a few weeks to get used to the "madhouse" facility. Caesar was immediately treated cruelly by chief guard Dodge (Tom Felton), Landon's sadistic son, who mocked Caesar and called him a "stupid monkey." Will demanded an appeal of his case within a week and pushed for a rapid court date, rather than the customary 90 days or more, although the clerk cautioned: "You're lucky they didn't put that animal down." Will's dad grew discouraged without Caesar to keep him company. Will planned to develop a "more aggressive virus strain" with a "faster delivery method" to combat his father's progressing dementia. He told Caroline: "I can't lose them both. I won't lose them both." However, when he spoke to his boss, he was cautioned that he had become unduly fixated with his team on the ALZ-112, and that it was "dangerous...and it doesn't work." To his boss' shock, Will divulged that he had treated his father successfully, but only for a few years, when the "disease eventually outran the cure." He claimed his father didn't just recover, but also improved. He proposed developing a more aggressive virus strain that also improved intelligence. When the Primate Shelter served chow to the animals, Caesar was sprayed by attendant Dodge with a water hose for tossing the slop back into his face. Dodge then bragged to his assistant: "He'll learn who's boss soon enough." Depressed, Caesar drew the shape of his attic's bedroom window on his cage wall to remind him of home. In the exercise yard, Caesar was treated with skepticism by his ape companions. He noticed Buck (Richard Ridings), a large and aggressive western lowland gorilla kept in solitary confinement, and Borneon orangutan Maurice (Karin Konoval). He was beaten down by dominant alpha male chimp, Rocket (Terry Notary), who ripped off his red sweater and intimidated him, until both beasts were put down by Dodge with tranquilizers. Caesar made friends with Maurice, who was a former circus animal able to speak in sign language. Maurice warned: "Be careful. Human no like smart Ape." Gen-Sys required three additional apes for further testing - they were taken from the San Bruno facility. Will suspected that Caesar was being mistreated in the shelter, and threatened to take him out - although he couldn't legally get permission. He promised to get Caesar released soon, but Caesar was increasingly angered by his imprisonment. Late one night, Dodge allowed his teenaged friends to briefly enter the caged area holding the apes, and said they could have fun by teasing the animals with an electrical prod. When one male got too close to Caesar's cage, the ape grabbed him by the throat, and then stealthily stole his pocket knife. After they left, Caesar attached the knife to the end of a stick and was able to cleverly unlock his cage door and free himself. He also released a grateful Buck from his solitary cage, and then the two lured Rocket out into the exercise yard. Caesar struck Rocket in the head with a metal gasoline can - and quickly established his dominance over him and all of the other now-respectful apes. Will successfully bribed John Landon with an envelope full of bills to release Caesar - but to his surprise, Caesar refused to leave his cage (Landon: "I guess he like it better here with his own kind"). Unbeknownst to Will, Caesar was hatching a plan for an insurrection to free all the apes in the facility - he told Maurice: "Apes alone weak. Apes together strong." Maurice responded: "Apes stupid." Caesar realized the only chance of success against the humans was to smarten up the other apes. He escaped from the dome of the shelter and headed for Will's house, where he stole three canisters of the new airborne strain of the ALZ-113 virus in the refrigerator, before sneaking back into the primate shelter. He released the virus throughout the caged area of the shelter - to boost the intelligence of all of the apes. Take your stinking paws off me, you damn dirty ape! Caesar rose up and shouted back, "NO!" - exhibiting a remarkable ability to speak. Caesar opened up all the other cages to free the others. When night-watchman Rodney (Jamie Harris) attempted to stop the uncaged apes, he was almost killed by the rebellious animals, but he was allowed to live by Caesar because of his more kindly nature to them - he was locked in a cage. Dodge was electrocuted with his cattle-prod when Caesar sprayed him with the high-powered water hose. All the apes liberated themselves by escaping through the windowed dome above the play area, and they headed toward the city. Will suspected trouble and rushed to the primate shelter with Caroline. There, they found Dodge's dead body, empty cages, and evidence that Caesar had used Gen-Sys vials of the virus to smarten up the other apes. Rodney stammered to tell them what had happened: "He spoke...Your ape. He spoke." They reported Dodge's fatality to authorities, who rushed to the scene and viewed security video-tape of the early stages of the unfolding disaster. Soon after, Caroline and Will headed onto the Golden Gate Bridge to locate Caesar. By then, Caesar had proceeded to the Gen-Sys laboratories with a pack of marauding apes, where he freed the Primate Shelter apes and others (Koba) that had been taken and held there for testing. When Jacobs entered the Gen-Sys lobby, he was surrounded by apes on the upper mezzanine levels. The apes crashed through the windows and rampaged through the streets. Jacobs joined the CHP in an arriving chopper, reported a breach, and ordered the apes to be tracked down and destroyed. Other apes were released from their cages in the San Francisco Zoo. From his vantage point in a helicopter, Jacobs noticed the apes were coordinated, and he suggested killing the leader. The apes scampered over rooftops, crashed through offices, saved a captured ape from an Animal Control van, and hurled manhole covers and parking meter poles at approaching police cars. Some of them hitched a ride on a trolley car toward the Golden Gate Bridge. They clamored across stalled cars and took over the bridge on their way north to the redwoods in Muir Woods on the other side of the bay. The plan of the SFPD was to deploy mounted units with batons to strike the retreating apes and drive them north, and to shoot them when they were forced into an open gap on the highway. The apes had the advantage of fog blocking them from clear view. They turned over an "Escape to Alcatraz" tour bus, used it as a shield, and pushed it toward the blockade of SWAT teams and police cars on the north end of the bridge. Caesar rode on horseback to lead the charge, as the other two groups of animals attacked from above and below. The officers were ordered to pull back as the apes swarmed over them. The helicopter approached with machine-gun fire, threatening the apes' conquest. Buck self-sacrifically jumped toward the helicopter and caused it to spin out of control and crash on the bridge. Caesar dragged Buck out of the wreckage as the big beast groaned and died. The sole bloodied survivor Jacobs begged for help, but was killed when the angered Koba stepped forward and tipped the helicopter over the edge, and it dropped into the water. Will: "I'm sorry. This is my fault. This has to stop. This isn't the way. You know what they're capable of. Please come home. If you come home, I'll protect you." Caesar: (embracing Will and whispering in his ear) "Caesar is home." Will: "Okay. Caesar is home. Go." Caesar scampered up to the top of a tall redwood - his example was followed by many of the other apes. From the treetops, they scanned San Francisco Bay. A lethally-infected Hunsiker was seen leaving his home for the airport - he was a uniformed airline pilot. The announcer on the taxi's radio reported on a "major disturbance" in the Bay Area affecting areas including the Zoo and the Golden Gate Bridge, with "widespread damage and some reported injuries." Apes had been seen running through the city. At the SFO airport terminal, a drop of blood from his nose spilled on the tile floor in front of a flight-status display board. Hunsiker had been infected with the virus by a contagious Franklin, who had sneezed on him earlier. His flight to New York would continue on to Paris (an animated graphic illustrated his air route's trajectory), and was also connected to other cities (in Africa, Asia and worldwide) - all infected by a spreading global pandemic. This latest Apes incarnation was an origin story (a prequel, and a reboot) intended to be occurring 2,000 years before the events of the first Planet of the Apes (1968) film, from approximately the year 2010 to 2016. 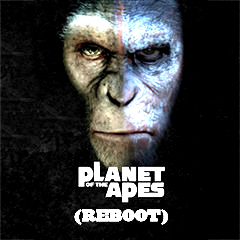 Its premise was similar to the one found in the fourth film, Conquest of the Planet of the Apes (1972). The name of the first ape to talk was also "Caesar" in that film. This Rupert Wyatt-directed action adventure film starred James Franco as a scientist in present-day San Francisco who discovered an experimental formula (for Alzheimer's Disease) that also increased an ape's IQ. With the tagline: EVOLUTION BECOMES REVOLUTION. Computer-generated ape faces replaced rubber-latex masks, and Andy Serkis had a starring performance as lead chimpanzee Caesar - the orphaned offspring of a lab chimp - seen with motion-capture technology. With a production budget of $93 million, and box-office gross receipts of $176.7 million (domestic) and $481.2 million (worldwide). The film received only one Academy Award nomination: Best Visual Effects. The next film in the series was Dawn of the Planet of the Apes (2014), directed by Matt Reeves, who was also tapped to direct a third installment (to create another "Apes" reboot trilogy). In Dawn, the setting was the year 2026, about 10 years into the future. A group of survivors (father and ex-architect Malcolm (Jason Clarke), Malcolm's wife and CDC nurse Ellie (Keri Russell), and human colony leader Dreyfus (Gary Oldman)), living in the ruins of San Francisco, were attempting to restore electrical power to the city by gaining access to a hydroelectric dam in the apes' territory. They came into conflict with a growing tribe of sentient apes led by Caesar (CGI- Andy Serkis again). Set-pieces: The rampage of an out-of-control Bright Eyes in the Gen-Sys lab to protect her secret infant baby, and the Caesar-led ape rebellion - with hordes of primates racing from the Primate Shelter into San Francisco, and across the Golden Gate Bridge.